Social collaboration is becoming more pervasive in an increasingly globalized economy. Social networking, discussion forums, and online chat systems are highly effective for sharing ideas within a community – especially in the area of product development and design. The results of a study conducted by McKinsey Quarterly “How businesses are using web 2.0”, June 2007, indicate that leading companies successfully leverage social collaboration technologies to improve communication between stakeholders (business partners, customers and employees). 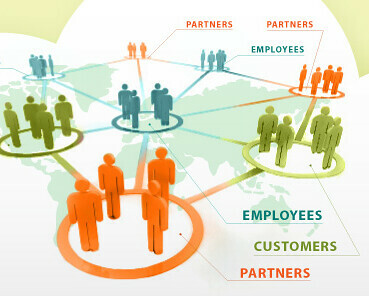 They also use social collaboration to increase customer engagement and drive product innovation. Research and experience also indicate that the benefits of social collaboration can only be maximized if the available technologies are properly implemented. 1. Improved decision-making based on dynamic information which results in reduced time-to-market and costs incurred by multiple product iterations. 2. Breaking down the barriers to communication and opening up discussions across all levels of the organization increases efficiency and engagement. 3. Improved team performance increases creativity, individual productivity and organizational profitability. Given that this is a 2007 study we can surmise that leading edge organizations have definitely focused their attention on improving communication and social collaboration between stakeholders including customers. Today, four years later, with the growing sophistication of the social collaboration technologies and tools, we could easily assume that these numbers have increased, especially the percentage of companies using tools to interface with their customers. Do you want all stakeholders on the same page, working to get the job done efficiently? OneDesk is social collaboration software that ensures collaboration between all stakeholders. You can improve your business productivity by leveraging the latest web technologies to get your team on the fast track. These tools enable your team to easily share valuable knowledge and expertise by breaking down the barriers to communication. Equip your team with the right tools for the job. Try OneDesk for free today.